This showcases another widespread condition in films: a lack of focus on the chess boards. This condition is, of course, far more widespread than Tarantino syndrome. In fact, it is so common that it must be considered the default and that it should be expected to be present when treating Tarantino syndrome. If so, one must of course deal with it first, so let’s do that. Everything here is pretty much conjecture, though. 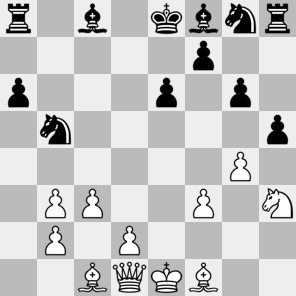 Black’s queenside is relatively certain, but that’s about it. Of course, the pieces had to be placed in such a way that there’s room for the candle, which is probably the reason for the unlikely configuration. I don’t know who the players are. Sure, the guy sitting on the left is general Smithers4 (Bruce Dern) and the one on the right is Oswaldo Mobray (Tim Roth), but in view of the aforementioned candle it seems very likely that the players abandoned their game a while ago. Whoever they were, they delayed development, didn’t guard the centre, pushed pawns willy-nilly – in short: they left a bloody mess. Typical of Tarantino syndrome. Realism: 2/5 Well, I guess it’s not too hard to reach the above position, so maybe that’s worth something? Probable winner: Black has the better chances, I guess, but more likely is that everybody dies in a huge puddle of blood.